Grant of Extra Work Allowance- (abolition of existing Caretaking Allowance, Extra Duty Allowance, Flag Station Allowance, Flight Charge Certificate Allowance, Library Allowance, Rajbhasha Allowance andSpecial Appointment Allowance ) - decision of the Government on the Recommendation of the Seventh Central Pay Commission (7th CPC). I am directed to forward herewith the copy of Ministry' of Finance Department of Expenditure OM No. 12-3/2016-E.IlI(A) dated on 4th February 2019 on the subject cited above, for kind information and further necessary action in this regard. 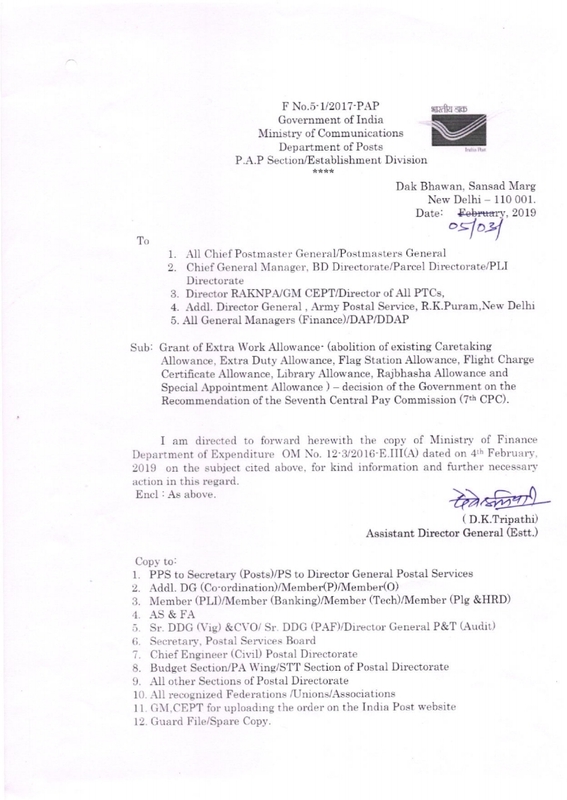 Subject: Srant of Extra Work Allowance - (abolition of existing Caretaking Allowance, Extra Duty Allowance, Flag Station Allowance, Flight Charge Certificate Allowance, Library Allowance, Rajbhasha Allowance and Special Appointment Allowance)- decision of the Government on the recommendation of theSeventh Central Poy Commission (7th CPC). The undersigned is directed to invite attention to this Department's OM No. 12-3/2016-ElII(A) dated 20.7.2017 on the subject mentioned above and to state that one of the conditions laid down in para 3(b) for grant of Extra Work Allowance is that"on employee shall receive this allowance for o maximum period of one year, and there should be minimum gap of one year before the same employee is deployed for similar duties again". 2. 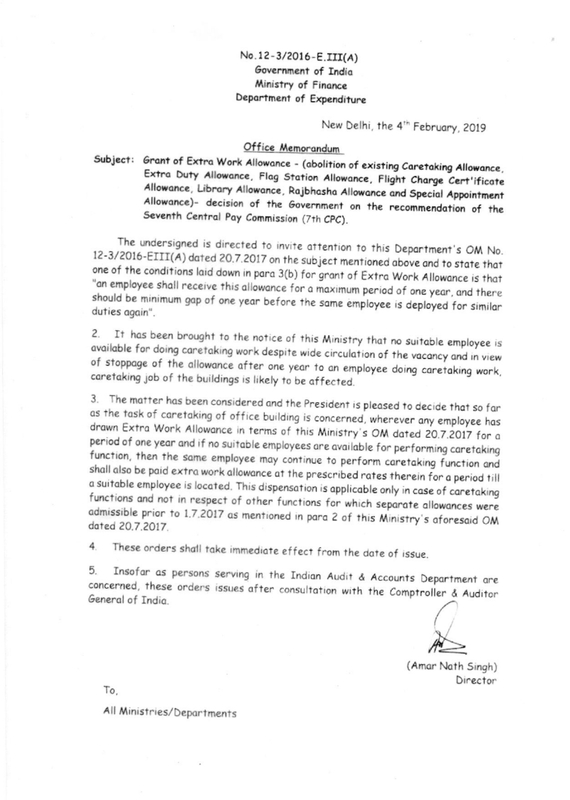 It has been brought to the notice of this Ministry that no suitable employee is available for doing caretaking work despite wide circulation of the vacancy and in view of stoppage of the allowance after one year to an employee doing caretaking work, caretaking job of the buildings is likely to be affected. 3. The matter has been considered and the President is pleased to decide that so far os the task of caretaking of office building is concerned, wherever any employee has drown Extra Work Allowance m terms of this Ministry's OM dated 20.7.2017 for o period of one year and if no suitable employees are available for performing caretaking function, then the same employee may continue to perform caretaking function and shall also be paid extra work allowance at the prescribed rates therein for a period till a Suitable employee is located. This dispensation is applicable only in case of caretaking functions and not m respect of other functions for which separate allowances were admissible prior to 1.7.2017 as mentioned m para 2 of this Ministry's aforesaid OM dated 20.7.2017. 4 These orders shall take immediate effect from the dote of issue. 5. Insofar as persons serving in the Indian Audit & Accounts Department are concerned, these orders issues after consultation with the Comptroller & Auditor General of India.